Food systems are typically defined as comprising all activities that are part of the production, distribution, and consumption of food. This includes (but is not restricted to) processes such as cultivation, harvesting, maintaining livestock, postproduction processing, packaging, storing, transport, selling, and consumption. In TCI’s conceptual framework, we extend this definition of a food system to also include factors that impact the distribution of food within a household and that affect individual-level absorption and intake of micronutrients. It is necessary that a food system be oriented toward addressing nutritional issues. A nutrition-sensitive approach not only takes into account policies related to the macro level access and availability of nutrient-dense food, but also focuses on more micro level determinants (e.g., household- and individual-level) of improved nutrition. We explain in depth what it means to have a nutrition-sensitive food system in our review article, “Transitioning Toward Nutrition-Sensitive Food Systems in Developing Countries,” published in the Annual Review of Resource Economics (Vol. 9, 2017, pp. 439–59). By emphasizing nutrition outcomes, this approach critically differs from previous others, which primarily focused on health outcomes. Our approach also goes beyond the “farm-to-table” pathway and weighs individual-level factors that affect the access, consumption, absorption, and inequity in food among members within a household. The primary goal is to enhance the diversity, quality, and safety of the entire food system while making it more accessible and inclusive to all people at all times. This necessitates special policy attention toward vulnerable groups. Therefore, our approach aims to address these nutritional concerns throughout the food system, using a holistic policy framework. 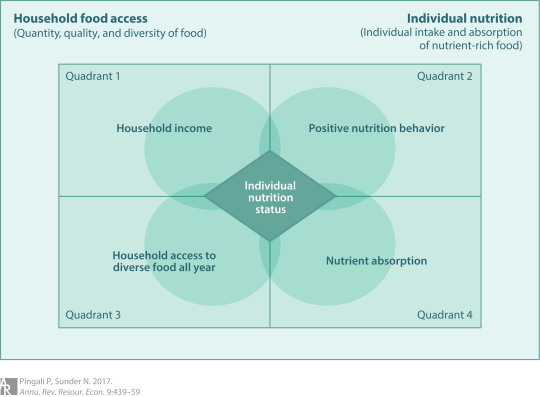 Conceptual framework: Multisectoral pathways toward improved individual nutrition. Adapted with permission from Pingali & Rickets (2014). requires a different suite of policies to foster and cater to this new demand. hinge on the stage of development being experienced by the country (state). transformation, markets develop, incomes grow, and consumer demand evolves. and nutrition outcomes for households. role in a household’s ability to access a micronutrient-rich, diverse diet. meat, and women and girls being left with only broth or gravies to consume). nutritional outcomes of their children. these spheres to ensure food safety across the supply chain. policy options, and how to potentially choose between different options. Naveen Sunder is a Tata-Cornell Scholar and fifth year Ph.D. candidate in the Economics Department at Cornell University. His primary research interests are in the field of development economics, health economics and applied econometrics.